Even or Odd…So Much To Think About! At the end of the day, Lauren, a 2nd grade teacher and I started chatting about her upcoming lesson on even and odd numbers. I have done a lot of thinking about even and odds in 5th grade when we entered decimals, however I can honestly say I have not thought about it much more than a number being able to be broken into two equal parts or it can’t because there is 1 left over. Now, I know Investigations is so purposeful with how they structure their pages so I was immediately curious about the set up of this page and wondering why thinking about even and odd in these two ways was so significant. My mind went right to the foundation for the commutative property. 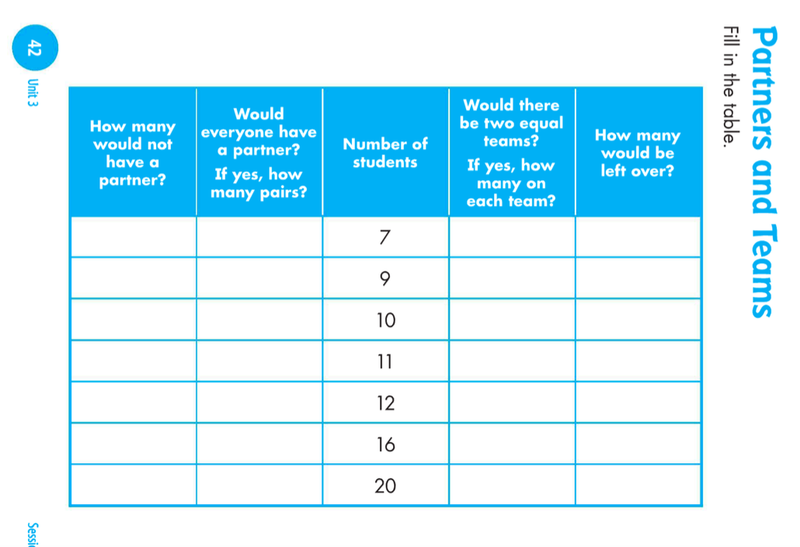 For example, with 10, will each have a partner? yes, 5 pairs or 5 groups of 2 or 5 x 2. Can we make two equal teams? yes, 5 on each team or 2 groups of 5 or 2 x 5. I would like to extend this sheet to include a space for the expressions: 2+2+2+2+2 = 10 = 5+5. So much great stuff to think about and I absolutely cannot wait to see how these students deal with conjectures and generalizations! I would love any more thoughts on this work because I am sure there is more great stuff in here! This entry was posted in Uncategorized and tagged 2nd Grade, Even or Odd on October 28, 2015 by mathmindsblog. Sounds interesting! One addition to the lesson could be to include the story “Even Steven, Odd Todd” by Kathryn Cristaldi. It’s an oldie but a goodie. I know that Marilyn Burns has included it in her latest resource, Math Reads. It’s a wonderful way to create inquiry, curiosity and wonder about odd and even concepts. Just a thought … everyone enjoys a good story. Oh I love that idea!! Thanks! Will pass that right along to the 2nd grade teachers! I love the teams and pairs to reinforce social connections! I wonder if there was any conversation about zero. 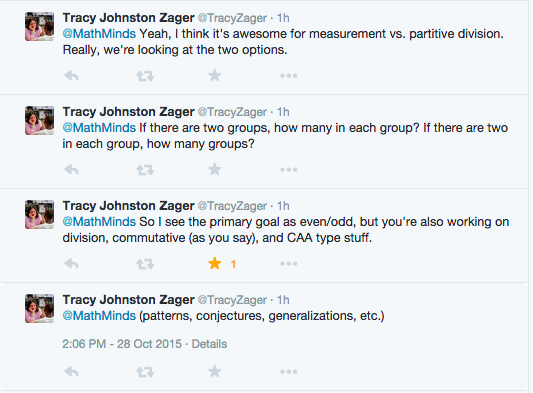 Zero works for teams since they would be equal (zero each) – might be interesting to hear students reactions to no pairs.